After picking up a victory in the season opener, the Colton boys' basketball team fell on hard times. The Vikings dropped 10 straight competitions, including four Tri-River Conference (TRC) games. Heading into Wednesday's game against Gervais, Colton needed a win in a big way. Except, that victory would have to wait a day. A power outage at Gervais High School led to the game being postponed until the following day, Thursday, Jan. 10. 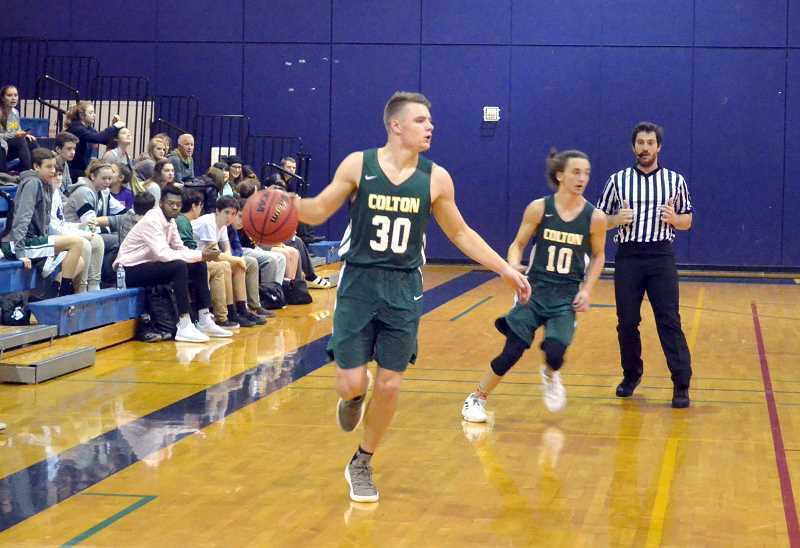 Finally on the court against a league foe, Colton made the most of it and dominated the Cougars 62-30 after four quarters of play. The win pushed Colton's TRC record to 1-4, and its overall record to 2-10. Gervais meanwhile falls to 0-5 in league, and 0-13 overall. The Vikings led 27-14 at the half, and tacked on another 20 points in an explosive third quarter. Leading 47-21 at the start of the final quarter, head coach Dan Chapman gave his bench players minutes and was pleased with their efforts on the boards. "Our bench did a nice job in the fourth quarter, winning the rebound battle 11 to three," Chapman said. The team was led by senior James Parker, who had 11 points, 6 rebounds, 7 assists, and 4 steals. Fellow senior Javontae Maes and sophomore Cody Tiano were next in the books, chipping in 11 and 10 points respectively. Maes also had 5 rebounds, and 2 blocks. Junior Seth Ethington had rebounds on the night. The team welcomed Culver on Friday, Jan. 11 and kept the momentum going. After starting out 8-0, the team never looked back, defeating the Bulldogs 67-35 to improve its league record to 2-4. Once again Parker had a big game, this time scoring 31 points with 5 rebounds and 3 assists. Maes had 11 points in the game, and was followed by sophomore Donny Maes (7), Cody Tiano (7), Earls (7), senior Steven Hagler (2), and freshman Travers Rogers (2).